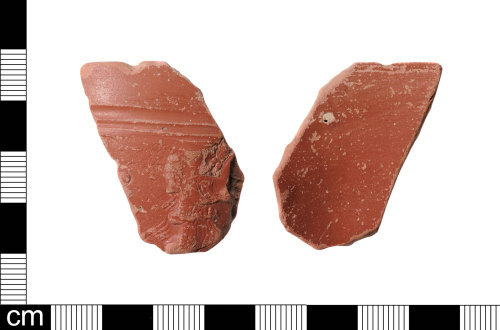 A rim sherd fragment from a Roman Gaulish samian ware hemispherical bowl or cup dating from AD 69-96. The sherd has a two groves below which it is decorated with a moulded figure of a huntress possibly Diana with a quiver on her back her arm bent ready to pull back the arrow on the bow. A similar figure is illustrated in Oswald (1936:23 Pl. VII Fig. 110). The sherd is possibly South Gaulish from La Graufesenque, as a number of its potters used this style of figure on their vessels. Oswald (1936:23) dates this figure type to the Flavian period. The fragment has a pink fabric and is coated in a red slip which is abraded with some of the slip worn away from the high points.